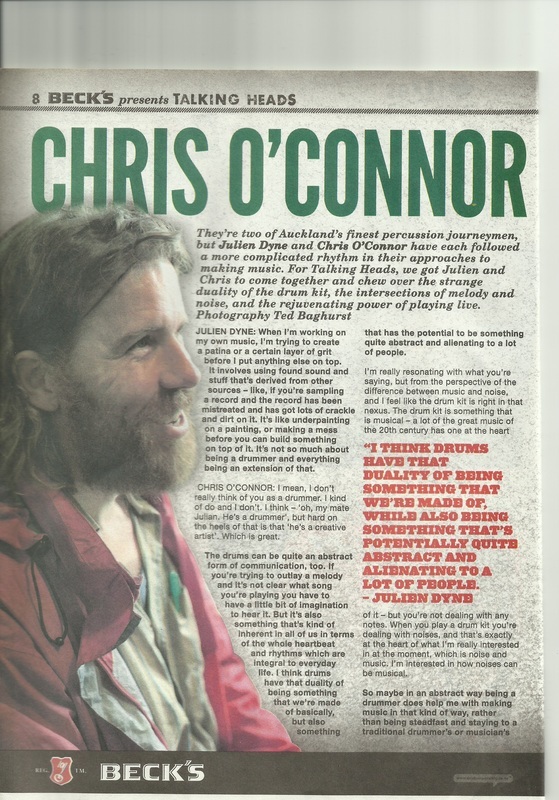 "It was the second time that I had caught Chris O’Connor at a gig and I can see why he is so in demand – especially for intricate drum work like this. Ron Samson’s skill on the drum kit was already very familiar to me and it was fascinating to watch these two percussion masters swap roles throughout the performance." - John Fenton, Jazz Local 33 Blog Site. Read the rest of the review here. Music review: New Zealand festival at REDCAT April 19, 2012 |By Mark Swed LA TIMES. The first of the two-day New Zealand in L.A. festival at REDCAT on Wednesday night featured eight chamber and solo works by Kiwi composers, none with much of an international reputation, and a renowned performer on Maori instruments, Richard Nunns. The audience was quite small. Despite the wonderful “Whale Rider” and the “Lord of the Rings” trilogy (Nunns performs on the soundtracks), New Zealand remains musically remote. I’m intentionally ignoring Hayley Westenra. But that could change overnight. And here's how. Spend a buck and download "He Poroporoaki," an extraordinarily seductive six-minute score for string quartet and Maori instruments by Gareth Farr and Nunns (it is on a new New Zealand String quartet release, “Notes from a Journey”), and see if you can stop playing it. It was the last formal piece on the program Wednesday. The title translates “Saying Goodbye,” and was written by Farr and Nunns in 2008 for a Dawn Service Commemoration in Gallipoli, Turkey. A sweet hymn-like melody in the string quartet is remotely Ivesian. But Nunns' poignant playing of a Maori flute invited the ancients to the ceremony. The result was not a clash of civilizations but, in a timeless quiet before the dawn, a yearning intersection of yawning traditions. This festival is the inspiration of Mark Menzies, a CalArts violinist from New Zealand with exceptional new music chops. It was organized by Glenda Keam, a gutsy New Zealand composer with a sense of humor. In her “Get [A Catalogue of Imperatives],” a soprano (Stephanie Aston) instructed us to get a life, get sick, get going and on and on, while an unnerved violist (Menzies) reacted with amusement and alarm. Most of the players Wednesday were from CalArts, thanks in part to the horrors that foreigners must now endure to obtain a U.S. visa. A REDCAT representative told me at intermission that the visa costs for the festival exceeded the artists fees. Some New Zealanders found it impossible to cut through the red tape and didn’t make it. But Nunns did, despite State Department obstacles even for a 66-year-old New Zealand “national treasure” who suffers from Parkinson’s and had just been improvising with an Italian jazz band in Rome last week. He played few of the Maori instruments he had laid out on a table, and he did so quietly in a group improvisation that Vinny Golia (on many different wind instruments), cellist Erika Duke-Kirkpatrick and New Zealand percussionist Chris O’Connor also kept impressively still. Every work was interesting, unusual, communicative, convincingly performed and new to North America. Christopher Cree Brown’s duo for violin (Menzies) and cello (Duke-Kirkpatrick) might have been a mating call from a curious, previously unknown species. John Psathas’ reverberantly amplified string quartet “Abhisheka” (played by the Formalist Quartet) engendered a fond and virtuosic response from Menzies in his own “spring elegy ‘aus 2011.’” Samuel Holloway’s Webernesque “Impossible Songs” for string quartet and soprano, James Gardner’s register hopping “Change” for bassoon (a world premiere played by Jonathan Stehney) and Victoria Kelly’s dramatically glacial piano trio “Sono” completed the impressive and illuminating program. Chris O'Connor is everywhere. He's in demand for his creativity, enthusiasm and spontaneity, and also for a particular gift: he knows instinctively what attitude, what gear, and how many chops, to bring to each gig. Despite relocating to Auckland from Wellington, he's just as likely to be back there (or anywhere) playing live, recording, rehearsing, developing multimedia music projects, or embedded in an after-hours free improv session.From his first album (Syzgy's 1996 'Tongue Grooves') onward, it's been non-stop - at least one album a year - combined with constant playing, in a kaleidoscope of different styles and different people. In the past five months alone, Chris has been on tour with SJD; played at AKO7 and WOMAD as a regular member of Don McGlashan's Seven Sisters; performed as a member of the Vitamin S free improvisation community with the Damo Suzuki Network; played at the Sound Invention Convention; played in the superb production of Janet Roddick and Plan 9's "Songs of Kurt Weill" also at AKO7; and created a live solo drum soundtrack for an alternative film event at Auckland's Galatos, where the films were projected onto an orchestral bass drum that he also used as his kick drum (great idea). Chris's latest album is also an improvised soundtrack (see review this issue), in collaboration with Sam Hamilton. Other current projects include upcoming albums with SJD and Don McGlashan; developing solo drum/film works with Korean artist Hye Rim; a tour of Korea with the trio Lippizanas, playing Albert Ayler and Cecil Taylor compositions; "Colossus of Roadies", a stage show written by McGlashan and Toa Fraser, to be premiered at Taranaki Arts Festival; Zig Zag, an experimental live film/music performance based on Len Lye's kinetic sculptures; more "Songs of Kurt Weill", including a soundtrack album; and a collaboration with guitarist Dean Roberts. Chris also teaches at Moore Music and Massey University, and presents 95bfm's Zambesi Jazz, where recently he devoted an entire show to local jazz tracks for NZ Music Month.